A fantastic marketing giveaway item, especially for exhibitions and conferences. The notebook has spiral binding, with a folded clip ball pen, available in a choice of red or blue covers with matching pens. Provide note taking convenience with these fun notebooks. 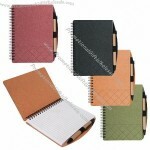 They can record important business meeting notes on the 70 lined sheets of notepaper. 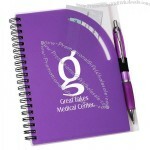 Flashy dual-toned front cover with curving trim will show off your logo! 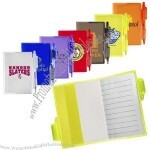 Store memos, business cards or lists in the handy file pockets on the front and inside cover. A side elastic pen loop houses a matching translucent curvy ballpoint pen with shiny silver accents. Size: 7" x 6" x 5/8". 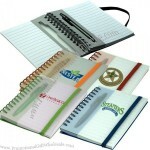 Distribute promotional spiral notebooks at tradeshows and community events! The design of this notebook will have them looking forward to taking notes. 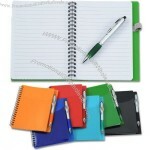 Spiral-bound notebook includes a translucent colored pocket on the front and inside covers for quickly stashing loose papers to easily keep track of your important documents. 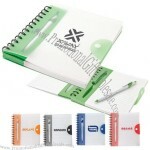 Includes a Curvy Stylus pen with a silver plastic barrel and a bright, color-matching rubberized grip for your comfort. 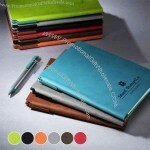 Notebook is available in a selection of colors to match your personal preference. Size: 7" x 5-9/16" x 1/2". Whether you're reviewing a speech, a project report, or a book, you'll want to take notes. You'll also want to mark passages that need special attention. And if several people (perhaps from different departments) will be reviewing the same document, you might want to color-code your notes, so that specific people know which notes are meant for them. Wouldn't it be great if you had something that combined everything you needed to review those special documents? The Mini Journal with Pen, Flags and Sticky Notes makes a great gift for clients, vendors, co-workers, and anyone else in your business circle. It also makes a great promotional giveaway at conventions, trade shows, product demonstrations, and similar events, since everyone will find a use for this item. Order yours today. Notebook has pen loop and elastic closure. Show your appreciation with these custom Cross journal sets! Whether they’re in sitting in class or working in the office, this Cross® tech journal set has them covered. Set includes a Cross Padfolio and the twist-action brass Cross Signature Mini Pen. Premier leather cover features a cleverly integrated pen sleeve that's ideal for storing the complimenting Cross pen. 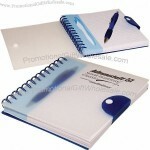 Has a refillable 100 page notebook with blue and gray page ribbons. 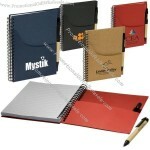 Features one document pocket and three business card pockets. Size: 10" x 7-1/4" x 1". Item Size: 3 1/2" x 5 3/8"
Packaging: Bulk, 38 lbs / 200 pcs. / box. 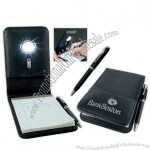 Includes the Translucent Starlight Pen and 120 pages of ruled white paper. 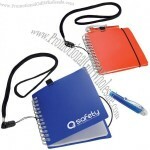 Double wire binding and snap fastener, pen color matches color of ruling, trim, binding, back cover and fastener. 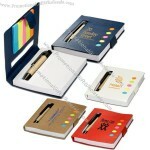 Optional imprinting on pen available for an additional set-up charge; please contact us for details. Mini Stowaway Pen/journal Set. 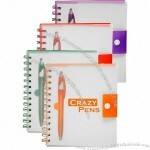 Mini plastic ballpoint pen nested in 50 sheets of ruled paper with polypropylene cover double metal ring binder and elastic closure Pen color matches color of ruling trim binding back cover and elastic. Item dimensions: 3-3/4''w x 5-1/8''h. Imprint size and location option(s): 2-1/4''w x 4''h on cover 1/4''w x 1/4''h on pen. 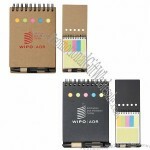 65 pieces per carton, 21.00 lbs per carton, carton size 10.00" x 16.00" x 14.00"
Eco friendly, handy spiral bound notebook is made of recycled paper. 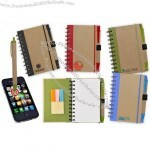 It includes sticky notes and paper flags, pen loop, and elastic closure. Also includes a FREE matching pen! Decorated with our "Thank You for the Lives You Touch, You're Appreciated So Much!" design. Product size: 4-1/8" x 5-7/8"
Eco Stowaway Stocky Jotter with Pen Includes five assorted neon sticky page flags, a 3" x 4" white perforated 80-sheet pad, and a mini paper barrel ballpoint pen in a recycled cardboard cover.Pen nestled in special die-cut slot. Tuck-in flap closure. 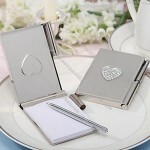 Custom-made Notebook With Pen From China Factory, Low price Notebook With Pen, Top Quality, True wholesale source for original!